Can you make non-game apps with Corona? That’s a question that comes up a lot. The short answer is “yes!” As an example, let’s explore Quebec Tourism, a recently released business-oriented app from Nicolas Michaud of Mobeva.com. Quebec Tourism is a non-game app built upon Mobeva’s white label tourism platform, created with Corona. This platform allows Mobeva to easily create custom tourism apps for different tourism offices around the world. With it they can promote the country, city, other locale, or set up guided tours. Using either Mobeva’s CMS (Content Management System), or by connecting directly to the customer’s database, the Quebec Tourism app can be quickly customized to offer a unique experience. It also supports both online and offline usage. 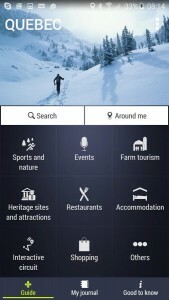 Quebec Tourism is currently available as a free download for iOS and Android.